5 "A call to build an organization for the 1990s and beyond"
Mike Murase was a member of the League of Revolutionary Struggle (M-L) and has been active in the Japanese national movement since 1968. He was a member of the Little Tokyo People’s Rights Organization in Los Angeles, and has participated in labor support work and efforts to stop harassment of immigrant workers. As a child, Mike Murase lived in an idyllic town in the Okayama prefecture, about 110 miles northeast of Hiroshima. He was born in 1947, after the Second World War had ended, but throughout his childhood he was reminded of it often. Murase’s parents sometimes took him and his older sister on train rides to see Hiroshima—what remained, what was destroyed, and the peace monuments erected in its place. In elementary school, Murase heard his teachers lecture about why war was bad and why peace was good. Murase’s father was a kibei nisei—he was born in Arizona to Japanese immigrants but moved back to Japan when he was still a child. Murase imagined that his father had a good life in America, because he often talked of going back. Before Murase and his family left Japan for Los Angeles in 1956, his mother bought him two children’s books about America. One told the story of Abraham Lincoln; the other, a book about all-American families, depicted fathers mowing lawns and mothers at kitchen sinks. Everyone in the images was white. When Murase arrived on the shores of San Francisco, the nine-year-old noticed that all the dock workers were black, and all the customs officers were white. Maybe he had misread the story of Abraham Lincoln, he thought. Maybe there were still slaves here. They were fleeting curiosities then, but as Murase grew older and the war ramped up in Vietnam, these early memories formed the basis of his opposition against the war. By the time Gidra started in 1969, roughly one out of every two Americans knew someone who had been killed or wounded in Vietnam. Murase and hundreds of other Asian-Americans created their own presence at anti-war marches, holding up signs that read “Makibaka!” (“struggle” in Tagalog), “Stop killing our Asian sisters!” and “Remember Manzanar!” referring to one of the 10 internment camps where Japanese Americans were incarcerated during World War II. Murase graduated from UCLA a year into Gidra’s run—he continued enrolling in classes to avoid the draft until he had so many units that the university asked him to leave. He continued working on Gidra while going to film school at UCLA and then law school at USC, living at home and working odd jobs in between—as a gardener, at gas stations, and in the library stacks. Starting in 1969, he began teaching some of the first classes on Asian-American studies at UCLA and later at Cal State Long Beach. Mike Murase--attorney, activist, administrator, writer and photographer--has been involved in human services, social change, education, government and politics for over 40 years. As an undergraduate at University of California at Los Angeles , he was a co-founder of the Asian American Studies Center and later taught ethnic studies at UCLA, University of Southern California and California State University at Long Beach. Mike Murase was a part of the core group who founded Little Tokyo Service Center, a social service and community economic development agency serving Little Tokyo and greater Japanese American community throughout Los Angeles. Murase served as the board president for first 5 years. He also advocated for members of Japanese Welfare Rights Organization, Little Tokyo People’s Rights Organization and National Coalition for Redress/Reparations, and authored Little Tokyo: One Hundred Year History. In 2006, Murase returned to Little Tokyo Service Center to join its management team and currently is Director of Service Programs. Gidra was edited by a changing, non-hierarchical collective that included individuals like Mike Murase, Doug Aihara, Evelyn Yoshimura, Steve Tatsukawa, and Bruce Iwasaki, along with a roster of talented graphic designers and artists that included Alan Takemoto, Dean Toji, David Monkawa, and Glenn Iwasaki. 1974 Gidra staff were Doug Aihara, Glen Iwasaki, Alan Ota, Bruce Iwasaki, Alan Takemoto, David Monkawa, Linda Fujikawa, Mike Murase Jeff Furumura, Evelyn Yoshimura, Dean Toji, Steve Tatsukawa, Carrie Furuya. In 1982 Mike Murase was a member of the League of Revolutionary Struggle(M-L), and Asian Americans for Nuclear Disarmament and in the Little Tokyo Peoples Rights Organization. "A call to build an organization for the 1990s and beyond"
Unity, January 28 1991, issued a statement "A call to build an organization for the 1990s and beyond" on pages 4 to 6. This group was a split in the League of Revolutionary Struggle which soon became the Unity Organizing Committee. Those listed as supporters of the call included Mike Murase, state coordinator California Rainbow Coalition, Los Angeles. . Guest editors of Unity, newspaper of the Unity Organizing Committee, June 1992, were Mike Murase , co-chair of Unity Los Angeles, and Lisa Neeley, vice chair of programs of Unity Los Angeles. The the March 1992 issue of the Unity Organizing Committee's Unity, carried commentary from several activists on their thoughts on politics in the 1990s. Those interviewed were Jane Johnson, Planned Parenthood, New York, Mike Murase, national executive committee of Unity Organizing Committee, Los Angeles, Mary Lou Casillas, president Our Casas Resident Council San Antonio Texas, Rick Adams, chair of Pennsylvania State Rainbow Coalition Pittsburgh, Lenny Goldberg, executive director California Tax Reform Association, Sacramento California, John O'Connor, chair National Toxics Campaign, Boston. In 1991 Mike Murase was an observer to the African National Congress conference in South Africa. 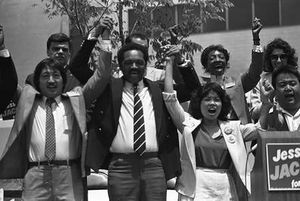 By 1988 Maxine Waters and Mike Murase were key organizers of the California Rainbow Coalition. At the 1987 National Rainbow convention in Raleigh North Carolina, a new board was elected, which included Mike Murase. In 1984 Mike Murase was Jesse Jackson's deputy field co-ordinator and Asian American Coordinator (California). In 1988 Mike Murase was Jackson's California campaign director. Mike Murase was chair of the Los Angeles Free South Africa Movement 1986-88, and as a district director for Congresswoman Maxine Waters. Asian American voters will hold an evening with Rep. Maxine Waters (D-Los Angeles) on Thursday, Aug. 9, from 6 to 9 p.m. 2012, at the New Gardena Hotel, 1641 W. Redondo Beach Blvd. Due to redistricting, Waters now represents the new 43rd Congressional District, which includes Gardena, Torrance, Harbor Gateway, Lomita and Hawthorne. She will give brief remarks and take part in casual conversation and exchange of ideas with her constituents on such topics as jobs, health care, veterans’ issues, Medicare, Social Security, home foreclosures, student loans, safe neighborhoods, quality education, and business development. Host committee: Assemblymember Warren Furutani, Sam Joo, Traci Kato-Kiriyama, Dennis Kobata, Alison Kochiyama, Dean Matsubayashi, Mike Murase, Erich Nakano, Alan Nishio, Amy Phillips, Jan Tokumaru, Diane Ujiiye. 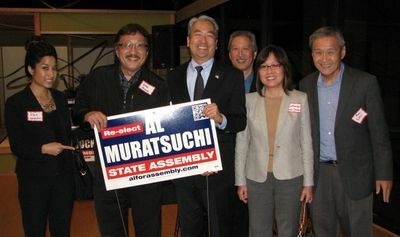 A reception supporting the re-election of Assemblymember Al Muratsuchi (D-Torrance) was held Oct. 28 2014, at the Japanese American Cultural and Community Center in Little Tokyo. The other co-chairs were Catherine Chuck, Kerry Doi, Ernest Doizaki, Warren Furutani, Stephen Gee, Toshio Handa, Thomas Iino, Bill Imada, Kenneth Inouye, Gary Kawaguchi, Alan Nishio, Kanji Sahara and Bill Watanabe. Steve Nagano with Tony Osumi, Alan Nishio, Kimi Maru, Jan Tokumaru, Mike Murase, June Hibino, Michael Yanagita, Kay Ochi, Glenn Sanada and Janice Yen at Japanese American National Museum. This page was last modified on 19 December 2018, at 02:05.